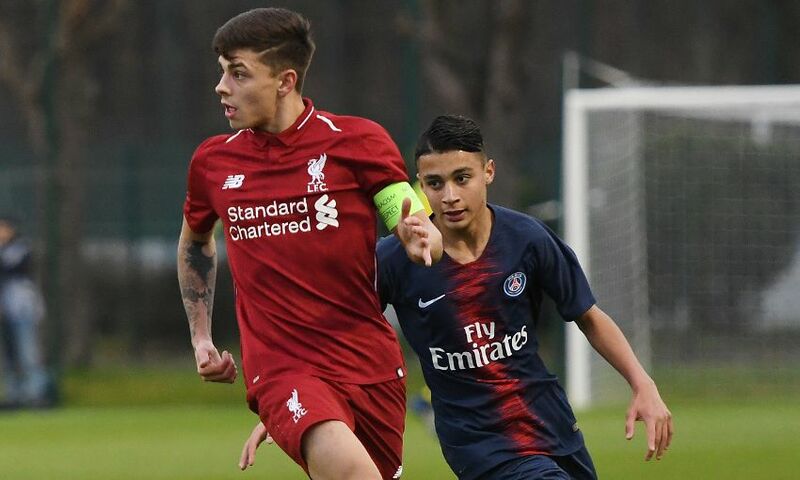 The race for automatic qualification from Group C of the UEFA Youth League will go down to the final matchday after Liverpool U19s were beaten 3-2 by Paris Saint-Germain. 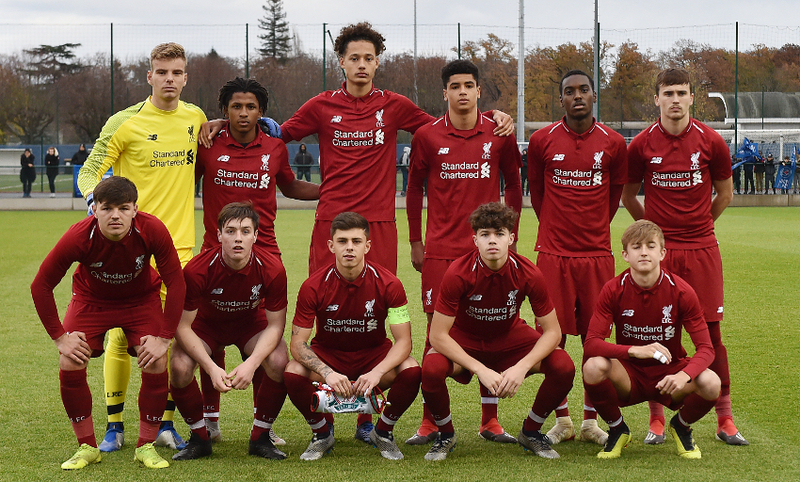 The top two teams in the section met in the French capital with the young Reds holding a three-point advantage over their opponents before kick-off. 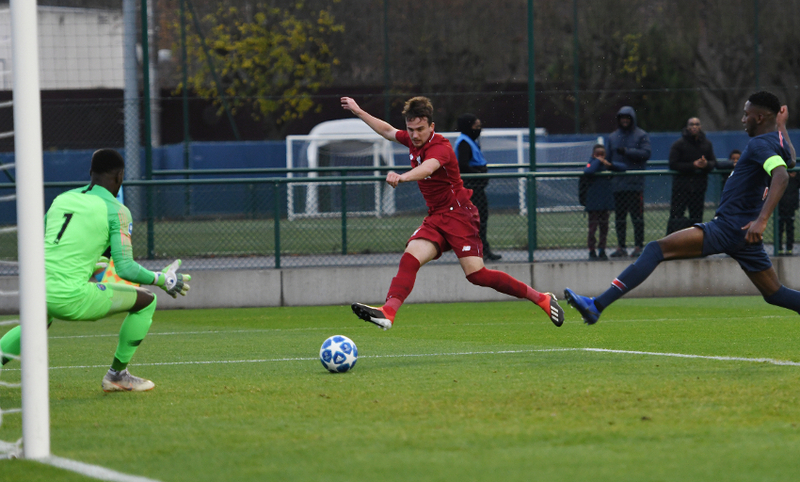 Liam Millar gave Liverpool an early lead but PSG levelled instantly through Ruben Providence and completed a turnaround when Arnaud Muinga struck four minutes into the second half and added a third late on. Millar forced in his and the Reds’ second in the closing moments to set up a grandstand finish – and only a fine stop by Garissone Innocent denied substitute Paul Glatzel a dramatic equaliser seconds after he came on. The final score means the sides are locked together on 10 points ahead of the last fixtures in December, with Barry Lewtas’ team in top spot by virtue of a better head-to-head record. The winners will automatically progress to the tournament’s knockout stages next year while the runners-up must compete in the play-offs. The visitors made a lively start in Paris and a period of concerted pressure on 11 minutes led to a frenzied passage of play at both ends. Bobby Duncan flicked a header wide when picked out by Adam Lewis’ chipped, diagonal cross but Liverpool were celebrating within 60 seconds. It came from a similar position, with Rafael Camacho showing excellent vision to see the unmarked Millar in the right hand side of the PSG area. The Canada international took a calm touch to control the assist and carefully side-footed a low finish beyond home goalkeeper Innocent. And the young Reds should really have doubled their early advantage when that same duo combined in reverse on the quarter-hour mark. Millar’s determination freed the forward on the right edge of PSG territory and the hosts’ defence misjudged his threaded pass into the box – but the arriving Camacho somehow fired wide from close range. Instead, they were punished immediately. From the next attack, Providence broke in behind to collect a through ball and smartly lifted a finish over Vitezslav Jaros and in to level. Liverpool were indebted to Ki-Jana Hoever for preserving the scoreline in the 34th minute. Cawdy Williams carried the ball into a dangerous position along the left channel before picking out Omar Yaisien in the middle, whose almost-certain goal was denied by a block from the Reds defender. A strong start to the second half by PSG saw the home side move in front. Romaric Yapi was the architect, creating space on the right wing and pulling a precise pass back into the area, where Muinga clinically tucked the ball home. The Reds stemmed the tide and should have equalised with 57 on the clock; Lewis swung in an excellent corner and Rhys Williams lost his marker – but headed harmlessly off target. With the game on a knife edge and so much resting on the result, both sides continually pushed forward, their risk-taking making for an open, absorbing encounter. PSG were inches away from perhaps putting the match to bed on 71 minutes, Adil Aouchiche sending an impudent, first-time flick from a right-wing cross off the near post. They soon did extend their lead, though. Jake Cain’s lunge on Providence in the box conceded a clear penalty that Muinga stepped up to sweep into the top left corner for a two-goal cushion. Still Liverpool refused to yield and they mounted huge pressure after Camacho’s dipping cross-shot from the left was nodded over the line by Millar at the back post. And Lewtas’ charges came agonisingly close to a stunning equaliser, Glatzel thwarted by Innocent’s reaction save and then denied a penalty at the end of an enthralling afternoon. Liverpool U19s: Jaros, N. Williams, Larouci, R. Williams, Hoever, Coyle (Longstaff, 73), Millar, Cain, Lewis, Camacho (Glatzel, 87), Duncan. Unused substitutes: Kelly, Dixon-Bonner, Brookwell, Sharif, Boyes.